Babe tests the onshore breeze washing over the terrace, taking in the sights and sounds and smells of this glorious last day of May 2007. Tempered by many Chelsea winters harsh and mild, the perennials are lookin' good. From left, clockwise: Pinkish flowers and gray-green leaves of dianthus purchased years back from a seaside nursery in Stonington, Maine; spiked leaves of hybrid bearded iris taken long ago from Mummy's Down East garden; and leaves and first flowers of Rosa multiflora, a weedy but deliciously fragrant volunteer. Magenta accents middle right are petunias bought locally and planted by Tuck in the freshly restored circular parterre just the other week. Ever seen one of these? 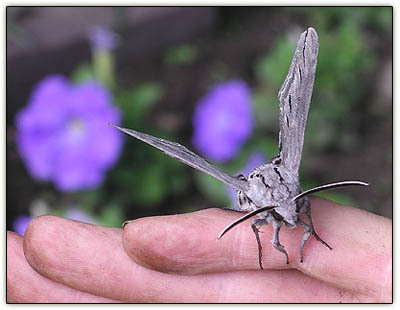 The size and shape and fuzziness told us it was a sphinx or hummingbird moth, but which species? 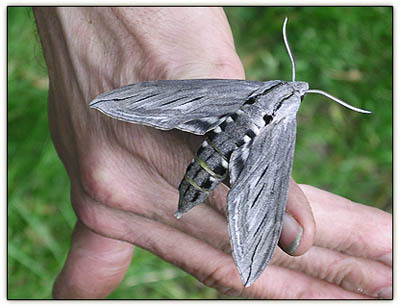 A quick Google search revealed we had a Great Ash Sphinx Moth (Sphinx chersis) on our hands (clinging to Tuck's pinky, above). 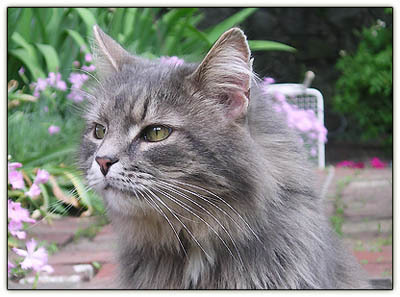 At first Tuck thought it was a stray clump of Chelsea Gray fur stuck on the garlic chives in the center of the parterre garden, but as he plucked it up, the clump moved. Adrenaline rush. Fight or flight? In horror, he tossed it into the weeding bucket. Taking a closer look, he was delighted to find our new friend. Fun facts: The females lay their eggs on the leaves of ash, lilac, privet, cherry and quaking aspen -- all species abundant in Chelsea private gardens and the urban forest -- the preferred diet of their voracious offspring, who spend their caterpillarhood eating, eating, eating. They pupate underground and then emerge to "fly as a single brood in the north and as two broods in the south from May-June and from July-August." 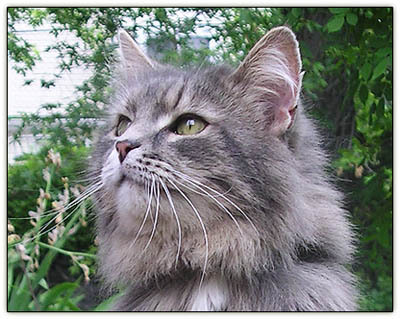 Who's the most beautiful boy kitty in the world? After he regained his composure, Tuck proudly displayed his find for the photographic record. Note honest gardener's dirt-embedded fingernails. Gloves are for sissies. Update: For more proud faunal displays, check out Modulator's Friday Ark #141 and Carnival of the Cats #166 at Fire Phil Garner. Thank you for the excellent photos and the lessons of the world of the garden. Great! "Who's the most beautiful boy kitty in the world?" Pam: According to one of my references, the species "flies from Mexico north through most of the United States, but it is rare in the Gulf States. Massachusettes is the specimen type locality." Even so, it's the first one I've ever seen in these parts.